Learning how to increase sweating in an infrared sauna will put you right on track to reap even more health benefits from your sauna sessions. Our skin is our largest organ and has five main functions: protecting us from organisms wanting to enter our body, giving us a sense of touch, synthesizing vitamin D from the sun, regulating body temperature through sweating, and eliminating toxins in the sweat. So it stands to reason that sweating more will help us get rid of more toxins, more quickly. An infrared sauna stirs up the cells deep within us to release more toxins than in a traditional heat sauna. The far infrared light is reported to penetrate 1.5 - 2" deep into our tissues to warm and activate cells to release toxins. The bloodstream, which also moves faster while in an infrared sauna, takes those toxins and delivers them to be eliminated. Next, the skin excretes the toxins in sweat. So, what can you do to increase sweating in an infrared sauna? Generally speaking, your body sweats when internal body temperature rises or when it's trying to burn up invading organisms, such as when we have the flu. But you can also increase sweating by increasing blood circulation and there are a couple ways to do that before your sauna. You can do some stretching and light exercises before your sauna session, but never sauna directly after strenuous exercise - cool down a bit first. Aside from light exercise, you can use a 'vihta' to get your circulation moving quicker. A vihta, which is popular in Finnish saunas, is bundle of green birch branches with which you gently swat your skin. The swats increase blood circulation and remove dead skin cells. A vihta should tingle, not hurt. But, since gathering young birch branches isn't easy to do everywhere, there are other alternatives. As a substitute to a vihta, you can dry brush your skin to improve sweating in an infrared sauna before getting into the sauna. You can purchase an actual dry brush at health food stores, or you can use a loofah or rough towel. The dry brush should be of natural material, not synthetic. When you dry brush, you're going to move from head-to-toe or toe-to-head, whichever you prefer. Use gentle pressure at first, but move up to what's comfortable for you. Make sweeping brush strokes from the bottom of your feet (if you start toe to head) towards your heart. Next, make strokes up the calves and thighs. Then up your hands and arms, and then from your back around to your abdomen. Always make brush strokes towards the heart, never away from it. 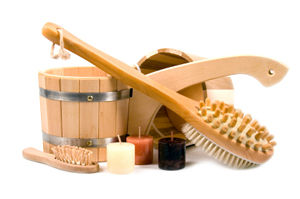 The benefits of dry brushing are several: dead skin cells are removed, circulation is stimulated, the lymph system is stimulated, and the immune system is stimulated. New, young skin cells are allowed to more easily emerge, making your skin softer and healthier. Dry brush before you shower and before using your sauna. If you dry brush before a sauna, you should still take a quick rinse in the shower before getting into the sauna to remove all the dry skin cells the brush stirred up. It's important to clean off the dry detritus before going into the sauna, even though you will shower again after the sauna. Think about going into a sauna to sweat when you have layers of dead skin all over you. How easy is it for the sweat glands to flow freely? On the other hand, once the dead skin is loosened and washed away, your skin is free of hindrances to its cleansing ability. It's also a good idea to shower before using the sauna if you used lotion or body cream. They tend to clog the skin pores and will hinder sweating. In fact, if you dry brush before a sauna, just rinse off in the shower, don't use soaps that can clog the pores again. Even though the benefits of skin brushing are helpful, some people should avoid dry skin brushing. If you have heart disease, high blood pressure, diabetes, easily irritated skin, broken skin or infections, you should probably avoid skin brushing. However, people with these conditions will still benefit from the benefits of sweating in an infrared sauna. If you are interested in more tips, you can also read sweating in your infrared sauna or the benefits of sweating, or you can read more background info about the infrared sauna system.